The channel-flipping flap was the latest example of how Donald Trump, at a pivotal moment in his presidency, is increasingly living in a world of selected information and bending the truth to his own narrative. WASHINGTON — On the first couple’s recent trip overseas, Melania Trump’s television aboard Air Force One was tuned to CNN. President Donald Trump was not pleased. 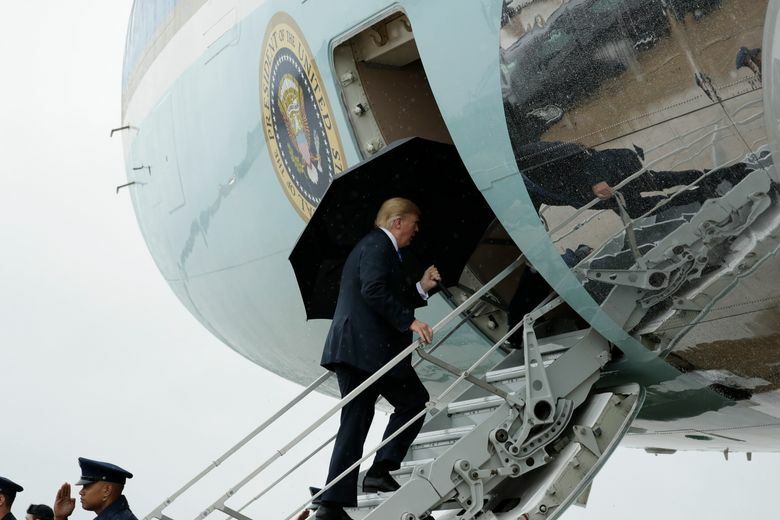 He raged at his staff for violating a rule that the White House entourage should begin each trip tuned to Fox — his preferred network over what he considers the “fake news” CNN — and caused “a bit of a stir” aboard Air Force One, according to an email obtained by The New York Times. The email, an internal exchange between officials in the White House Military Office and the White House Communications Agency this past Thursday, also called for the ordering of two more televisions to support Beam, a TiVo-like streaming device, to make sure the president and first lady could both watch TV in their separate hotel rooms when they travel. The channel-flipping flap was the latest example of how Donald Trump, at a pivotal moment in his presidency, is increasingly living in a world of selected information and bending the truth to his own narrative. As his aides work to keep him insulated from the outside world, Trump is doubling down in his efforts to tell supporters to trust him over the words of critics and news reports. “Stick with us. Don’t believe the crap you see from these people, the fake news,” Trump said Thursday at the annual convention of the Veterans of Foreign Wars in Kansas City, Missouri. Similarly, as the negative headlines continue after Trump’s meeting in Finland this past week with President Vladimir Putin of Russia, Trump has shifted from blaming U.S. institutions for a bad relationship with Russia to telling people not to believe the facts of what they have seen or heard. On Tuesday, the president effectively said black was white when he claimed without evidence that Russians would be helping Democrats — but not him — in the coming midterm elections. In January 2017, U.S. intelligence agencies assessed that Russia had interfered in the 2016 presidential election in an effort to help Trump. In his tweet, Trump made no mention of the fact that he has been told repeatedly that Russia ordered a series of attacks to sway the 2016 election. Nor did he say that he has struck a conciliatory view toward Putin even as his administration and Congress have moved to impose harsher relations. Over the weekend, Trump claimed with no evidence in a series of tweets that his administration’s release of top-secret documents related to the surveillance of a former campaign aide had confirmed that the Justice Department and the FBI “misled the courts” in the early stages of the Russia investigation.